When my wife was three, she heard her older siblings lamenting how awful it would be not to be able to read. She chimed in, “Oh, it’s not so bad.” That said, she has always had a passion for literacy and is now a librarian. One of our favorite secular charities is Literacy Advance of Houston. They do great work in helping improve lives and families. Check ’em out. The mission of Literacy Advance of Houston is to teach adults to read, write, and communicate in English so they can achieve their full potential as parents, workers, citizens, and community members. Here is the story of Lester, who learned to read from the tutors at Literacy Advance. He read this at a banquet where Barbara Bush spoke as well. Thank you, Mrs. Bush. I am very honored to be here tonight. I have struggled with my reading since I was in elementary school right here in Houston. I was a pretty good student in math and science, but reading was always a problem for me. I was labeled a slow learner when I was about 12 years old and put in an alternative school. The chance to learn stopped with that school where all we did was play games. By the time I convinced my mother to help get me back into regular school, I was two years behind. I was moved along in high school and graduated, and I tried college—but it didn’t work out. All my life I was embarrassed about my reading and writing problems, and I hid them away as best I could. But these problems affected my life in many ways, from my marriage to my ability to make a good living. I had low paying jobs for most of my life. My family always knew I had a problem and tried to help me. I always asked them for help with spelling and I relied on them to help me understand the meaning of words. You see, for me, words were just words on paper. I couldn’t grasp the meaning of them when they were strung together. And then, two things happened that changed my life. My sons, Kevin and Christopher helped me with reading as they were developing their own reading skills. I realized at that moment that I was going to go somewhere to find someone to help me. I had always believed that I was smart enough to fix my problem if someone could help me figure it out. I knew I couldn’t do it on my own. I googled READING on the computer and began to search for help. And…I found it. I found Literacy Advance of Houston and in a very short time, after putting aside the embarrassment about my reading and writing, I was working with my first volunteer tutor. Lucky for me, he was a Frenchman. He would say to me “you have to fall in love with the story”. One day, he had me read a section in a book and then write down what it meant to me. I read and I wrote—crossed it out, wrote it again and crossed it out. This continued until I finally wrote something that really made sense to me. I realized I had just written the first paragraph I could remember. Tears came to my eyes, and I could not stop crying. My second tutor, Pat McCracken, who is here tonight, has helped me make more progress in my reading skills. I finished reading my first book, “The Things They Carried” a wonderful book about soldiers in the Vietnam War by Tim O’Brien. I learned what it is like to “fall in love with a story”. After all the years of struggling, my life has changed. I am taking courses at Houston Community College. I will get my degree, one course at a time. I have the best job I have ever had at Walgreens Distribution Center. I have been able to grow in my job because of my new skills and the confidence I have in myself. Over the years, my wife and I encouraged our children to learn to read and to do the best they can in everything they do. My Children are here tonight — my sons, Kevin and Christopher, and one of our daughters, Jessica. Our other daughter, Elsa, who is studying to be a CPA, lives in Washington, DC. When Jessica was in high school her teachers called us in to tell us she was an exceptional student—I was afraid that meant she was in trouble. Jessica earned her degree in Chemical Engineering from RPI, and in June, she will receive her MBA from Stanford. I hope you will allow me, the Proud Father, to ask my family to stand so I can introduce them to you. In our City, there are thousands of people like me who have serious problems with reading and writing. I hope my experience will teach my children and others that it is never too late to learn and that you should never, ever give up. I no longer feel the shame as I am able to read and write. I continue to push myself, and I know I can overcome any problem standing in my way. I want to thank everyone at Literacy Advance for changing my life. 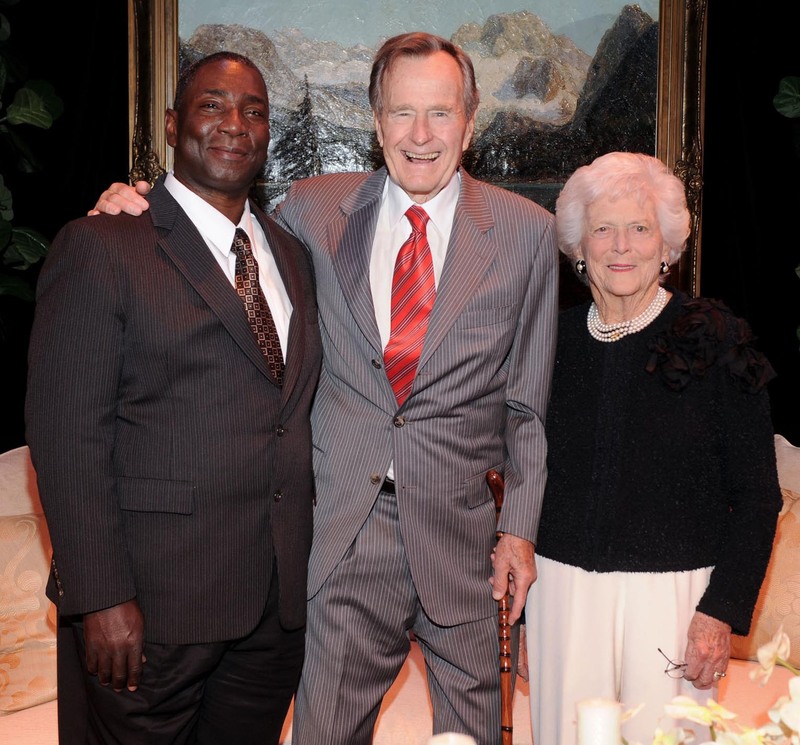 And I want to thank Barbara Bush and all of you here tonight who support the essential cause of Literacy. Praying the scriptures is a great idea. If you aren’t sure what to pray you have 31,173 verses pre-approved by God. Check out Alysa’s post about praying 1 Peter 5. Question: Is the intent of the DNC to replace black voters with Hispanic ones, as low-information pets of the party? Interesting analysis by Hillbuzz. In 2008, Donna Brazile famously declared, during the presidential primaries, that the DNC no longer needed blue collar workers, rural voters, senior citizens, or gay and Jewish voters, because the coalition they were building of blacks, college-aged first time voters, Hispanics, and women were enough to win national elections. No one else need apply. We wonder if Brazile’s candor didn’t leave out part of what’s going on — and that’s actually the DNC’s abandonment of blacks completely, replacing them as pets and dependents with newly imported Mexicans. We’ve long believed that Liberal-controlled public schools in cities like Chicago are deliberately kept so terrible that black students never learn the social, academic, or life skills to succeed in life — and are instead kept dependent on the government for their welfare. New DNA Damage Repair Mechanism Must Have Arisen Early — the workings of DNA are endlessly fascinating, and typically make a mockery of neo-Darwinian evolution. This conclusion that complexity comes early is often forced on evolutionists, in spite of the evolutionary expectations to the contrary. Here’s something not to get excited about — the alleged discovery of Noah’s ark. If it is the Ark, may it wake up the biblical sceptics . . . And if this is just another hoax, it’s no big deal. My salvation isn’t dependent on (or in need of) scientific confirmation of incidents in the Bible, but on my relationship with God. His reality confirms His Word. Dawn of the Dead, Dawn of the Unborn, it’s the same nonsense. Does that protection extend to females – who are ALREADY alive? I don’t see what it proves to just say an argument is nonsense. Seems to me that non sequitors like “dawn of the dead” are less sensible than appeals to scientific facts and basic morality (i.e., you shouldn’t kill innocent human beings). Re. protection to females: Of course protection extends to them if you are talking about saving the life of the mother. That is consistent with the pro-life ethic. If you are talking about the preference of the mother to have her unborn child killed — over half of whom are female — then that is a different story. Females also need protection from the boyfriends and parents pressuring them to abort, which is very common. And they need protection from statutory rapists, like those that Planned Parenthood and other abortion clinics willfully and illegally hide in their zeal to make money. An authentic human rights activist has plenty of work to do fighting the abortion industry. Parental notification laws — parents are the primary protection for children, and schools can’t give an Advil to your child without permission. But they can take her for an abortion?! Informed consent — how can hiding information from women protect them? Do pro-legalized abortionists thing women are too frail to handle the facts? Option to see ultrasounds of what is about to be aborted — same as above. And who funds crisis pregnancy centers with their own time and money to provide free services to women and families in need? The pro-lifers, not the pro-legalized abortionists. In fact, the pro-legalized abortionists consider pregnancy centers to be the enemy and fight them as much as they can. No surprise, as we cut into their abortion profits. Pro-lifers are the ones protecting women, not pro-legalized abortionists. Should we velvetize the Bible’s hard truths to suit a culture that hates moral clarity? — Short answer: No. Click for a great response from Charles Spurgeon. Pastor Timothy has moved his blog home to WordPress, so be sure to update your favorites and/or blog readers with his new page. John Stossel explains how environmentalism kills millions of people — DDT saves lives. And why didn’t the opponents show up to debate? Actress Janine Turner is a conservative and not afraid to speak out. Yea for her! Bring back Northern Exposure. The use of images in the pro-life movement can be a controversial topic, but used appropriately I think they add a lot of value. What could be more relevant than the truth about what the procedure in question accomplishes? I didn’t get the precise quote as I heard it on a Podcast of Stand to Reason, but Greg Koukl quoted Melinda Penner saying that showing pictures of aborted human beings is a way for the victims to give their testimony. A tale of 2 protests. Watch and decide for yourself. Also see New Video of Tea Party Protest, Still No N-Word. Where is the retraction from the MSM? If you want utopia . . .
. . . then repent, believe and wait. But don’t expect to find it in this life. Sadly, too many people naively think we can have a utopia in this life and they drive untold carnage in their misguided efforts. Some people spout stereotypes so reflexively that they don’t even realize how they are contradicting themselves. A commenter at the Sojourners blog was quick to play the “conservatives are racist” card and insisted that white conservatives are upset about losing our majority and are doing everything we can to fight to keep it. Of course, we do the opposite of those things. So we are either completely unaware that our behaviors are hastening our demise (eek!) or maybe — just maybe! — we aren’t racist after all. Perhaps we think it is immoral to kill innocent human beings of any skin color and we would gladly sacrifice our majority to save lives. If any group is racist, wouldn’t it be the one supporting policies that result in non-whites being destroyed at rates faster than whites? Defending conservative principles is not racist. Playing the race card instead of using facts and logic is racist. I encourage you to watch this interview with Abby Johnson, former Planned Parenthood Director. She not only makes many excellent points, she does so in a truly winsome and attractive way. Planned Parenthood isn’t pro-choice, it is pro-abortion. They counsel against adoptions and use high pressure tactics to get women to have abortions ASAP. They avoid ultrasounds of abortions, even though they are safer. (What happened to safe, legal and rare?) Johnson left PP after she saw an abortion on an ultrasound. When Johnson was a counselor, her supervisor got mad when people chose life. Sidewalk counselors save lives! There are countless stories of people alive today because those counselors made a difference. The church needs to talk about abortion more. It needs to be a safe place for people who have had abortions. PP plans to do late-term abortions in Houston, but they are not telling people that . . . yet. Protesters make a difference with clinic workers as well. It is a reminder that what they are doing is wrong.